People sometimes ask me, "Am I a healer? How do I know?" It's clear that they think it's a rare and special gift given only to a few. I think a lot of people feel that way. To me, the ability to help others heal is just part of being human. To ask "Am I a healer" is like asking, "Am I human?" But beyond that, there are two important points to consider. First, there are many ways to be "a healer," and you can do "the work" from any place in life. You can be a healer (or not!) as a medical doctor, a nurse, or any of the other conventional healing roles. You can be a healer in a less traditional way, such as being an energy healer. But teachers, politicians, photographers, counselors, store clerks, moms, dads, administrators, roofers, childcare workers, and anyone else in the whole wide world can be powerful healers as well. You don't have to go to school or hang out a shingle. You can do this work from where you already are. The second point is that energy healing is more a path than a skill set or ability. Anyone can walk at least a little ways down that path, assuming their intentions are good. But to go very far on the path, you must be intentionally evolving, continually working to raise the calibration of your energy. Do you want to be a healer? Do you want to set aside your own ego and help others activate their own self-healing powers? Do you care enough about doing it that you'll do it quietly from where you already are? Do you want to walk the spiritual path, the evolutionary path, that is necessary to develop as a healer? Because it's not HAVING the gift of healing that's special. It's DEVELOPING it that's special. That happens naturally if you truly want it to be your path—but it has to happen. So in a way I suppose "being a healer" is mostly about hearing a "calling" and answering it. If you're wondering about whether you're a healer, you've already heard the call. What you do with it is up to you. 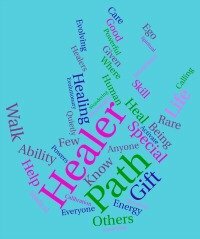 Go from Am I A Healer to Learn Energy Healing main page.